Hey teens, get ready to rock the library later this month at our first ever lip sync battle. On Friday, July 27, at 7 p.m. let out your inner diva and dazzle friends and adoring fans with your very best rendition of a favorite song. There will be prizes, crafts and ice cream. You are also welcome to just cheer on friends or watch the show; you don’t have to perform in order to take part. Send your song choice to tori@bplteens.org by July 20. Please make sure it is the “clean” radio version and lasts no longer than 1.5 minutes. Celebrate the Town of Bethlehem’s 225th anniversary by entering your best shot of the town in our photography contest. Photos must be submitted framed (maximum size is 11 by 14 inches) and ready to hang between July 30-Aug. 31. Entries will be on display in September with winners in four age groups awarded Friday, Sept. 21. Visit our website at bethlehempubliclibrary.org for entry form and details. Prizes will be provided by the Friends of Bethlehem Public Library. Need to check out your materials in a hurry? Would you like a little privacy? The new self-checkout kiosks at the Circulation Desk and the Children’s Place give you plenty of checkout options. Our whimsical robot kiosk in the Children’s Place will delight young readers and give parents the opportunity for a quick exit if they sense a meltdown looming. Two self-checkout machines at the circulation desk are user-friendly and will help speed up the checkout process during our busier times. Unfamiliar with the technology? Our staffers are happy to help walk you through the process until you are comfortable with it. One of our favorite features of the new machines is that staffers can step in any time and complete the transaction seamlessly without having to cancel everything and start over. We know some library users will always enjoy face-to-face interaction with staff. No worries. We’re not going anywhere and will still be at the desk to assist you in person, if you prefer. We are still looking for people willing to share their specials skills at our How-To Festival on Saturday, Aug. 4. From noon-2 p.m. artisans and instructors will demonstrate their trades – from blacksmithing to yoga – to members of the community. If you are interested in sharing your knowledge on a topic, we’d love to have you join us. Contact Natalie McDonough at (518) 439-9314, ext. 3023 or by email at natalie@bethpl.org. The library has begun offering free year-round WiFi at Five Rivers Environmental Education Center in one of the first DEC/public library partnerships in the state. Now you can connect to “Free Library WiFi” when you’re out and about at Five Rivers picnicking, hiking or exploring the nature center. This network is in addition to “Free Library WiFi” at the town park and pool, as well as inside and outside the library building. 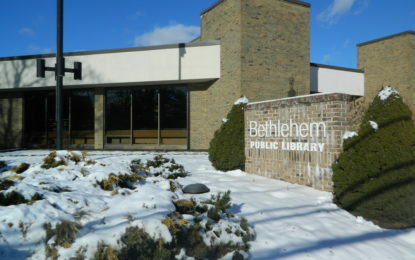 All events are free and take place at Bethlehem Public Library located at 451 Delaware Ave., in Delmar. For more information, call 518-439-9314 or visit our website. Like an Escape Room, use puzzle-solving skills to unlock the box in time, 2 p.m.
Sign up online or call. Bring a blanket or pillow; we’ll supply the popcorn as you watch “Peter Rabbit” (PG, 89 min, Columbia), 2:30 p.m. Wear some painting clothes and decorate a mini flowerpot with colorful acrylics. Supplies are limited; registration required, 10-10:45 a.m.
For grades 1 and up. Sign up online or call. Watch some Japanese anime with other teens and experience this unique style of storytelling. Film will be dubbed in English, 10:30 a.m. Snacks will be served. Bring in a piece of your original artwork or a photograph, and we’ll use it to create a custom library card to be printed on the spot, 2-4 p.m. If you don’t already have a card, bring in a photo ID and proof of residence within the Bethlehem Central School District. Enjoy a trivia contest with prizes while you sign up for the Adult Summer Reading Challenge and preview the Summer Reading raffle baskets, 7-8:30 p.m.
Prizes provided by the Friends of Bethlehem Public Library. An Albany Visitors Center Educator will talk about how mythology helped ancient astronomers interpret the night sky, 10 a.m.
For ages 9 and up. Sign up online or call. The band’s name means “fun and music” in Gaelic, and they play traditional contemporary Irish folk with some popular tunes thrown in the mix, 7 p.m.